Muldoon is turning EIGHT next month on July 29. When I rescued Muldoon, I had no idea what kind of adventure I was in for. Little did I know those big brown eyes and overly enthusiastic tail would inspire me to keep going every day. 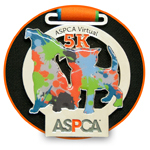 In honor of his birthday, he's running his first 5k to raise money for the ASPCA. We're looking to raise just $250 to help animals who haven't been as lucky as we have, and still need support on their journey to finding forever homes. We'd love your help in reaching our goal! Please donate and share with all the dog and cat and bird and reptile people you know! I'll send updates and share lots of pictures when we run on Saturday, July 29.